Inside your body, you have some specialized cells called “beta cells.” Beta cells are very important, because they make insulin. And insulin is a hormone that controls the level of glucose in your blood. Too much glucose and you could experience a number of symptoms, such as fatigue and excessive thirst. Not enough glucose, and your heart could beat rapidly, and you may feel weak and get headaches. Now, your beta cells help you balance between too much and too little glucose. But when you have diabetes, beta cells can be mistakenly destroyed by your body’s own immune system. Without beta cells, your pancreas can’t make insulin. Here’s one way to make sure this doesn’t happen. 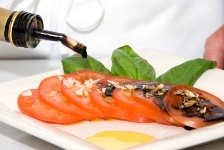 Researchers have discovered that balsamic vinegar is a healing food that helps increase beta cell production. They conducted a study to investigate the effects of balsamic vinegar on beta cell dysfunction. For the clinical trial, rats were fed a normal diet or a high-fat diet and were provided with tap water or dilute balsamic vinegar for four weeks. The research team then conducted some oral glucose tolerance tests. They found that, in rats fed both the normal diet and the high-fat diet, those also given balsamic vinegar showed increased insulin staining in islets (where beta cells are found) compared with tap-water-administered rats. Balsamic vinegar administration also decreased cholesterol levels. The researchers concluded that there is an anti-diabetic effect of balsamic vinegar through improvement of beta cell function. Use balsamic vinegar as a substitute for salad dressing or marinades. By replacing these fattening condiments with balsamic vinegar, you can lower your caloric intake. Balsamic vinegar may also be able to suppress your appetite, helping you to eat less. Just make sure you buy true balsamic vinegar—that means no added sugar or other unnatural ingredients. This tasty vinegar can also net you a little manganese, calcium, potassium, and iron.